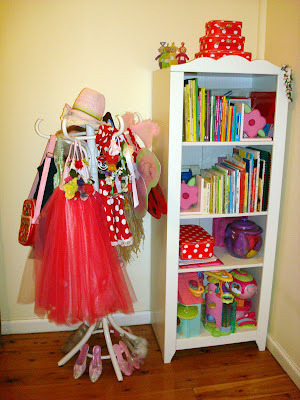 Ok, I thought that I should show you the rest of my daughter's room. I just showed you the bed etc before because they were all new then I thought that even though the rest is old, it's new to you. I'll start with the pictures over her bed. When I was little (back in Sweden) I used to collect paper bookmarks. 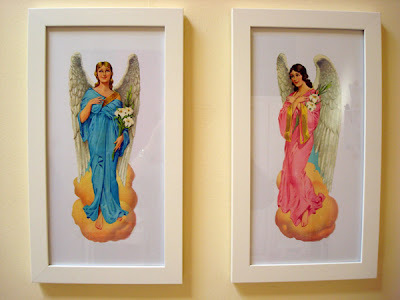 The two angels in the frames are bookmarks that I was given when I was 6-7 years old. Initially I was hunting for a more ornate frame but I think that the plain frame works really well. 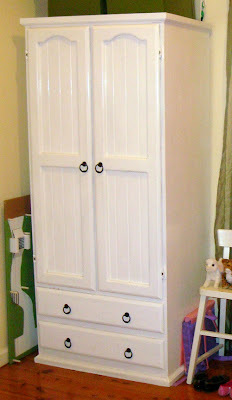 Ok, this is just a plain wardrobe that I bought through the Trading Post and painted white in the garage. I will get back to the wardrobe shortly. The little desk was a birthday present a couple of years ago, she loves sitting there pretending to write letters to friends. If you are wondering what the curious little figures are, please see below. 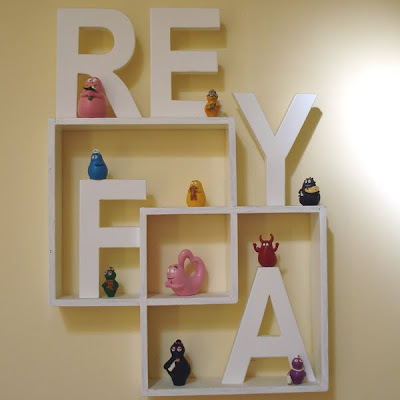 Ok, here is another example of my geeky figure collecting mania. 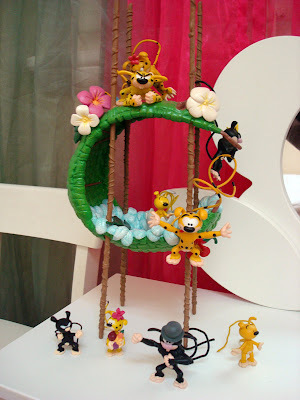 These are called Marsupilami and they are from a cartoon with the same name. Another one that I grew up with. Lucky for me my daughter actually likes what I force on her. Ok, back to the wardrobe. I would really like to do something with it but not sure what to do. 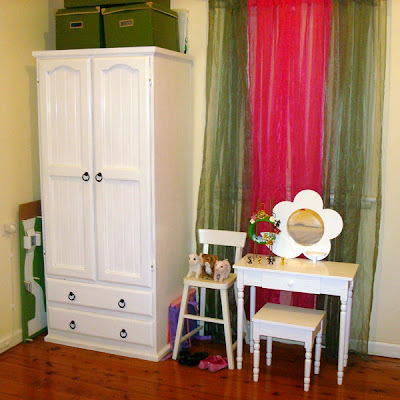 I am thinking of the obvious at this stage, changing the door knobs but I would like to do something more. Please let me know if you have any suggestions and once I am finished doing something I will post a picture. HEJ!!! Har äntligen tittat, var väl lite orolig att du skulle säga upp bekantskapen annars... :-) Nu förstår jag varför du inte har tid för facebook! Vad FINT hennes rum är! Kul med alla figurerna också, jag kommer väl ihåg dem från när vi växte upp förstås! Hoppas allt är bra! Vi har varit och campat och det blev så stormigt och vi var magsjuka så kom hem en dag för tidigt. Nu är det fortfarande härligt att bara vara hemma! Kramar, E PS Är hennes rum alltid så städat? !